You might never have really thought about it as a kid, but the toys and Collectible cards of your childhood might be worth more today - a lot more, considering the internet's viral reaction to a collector finding an ultra-valuable Magic card last week. Here's 11 Cards and Figures that are worth a pretty penny today. 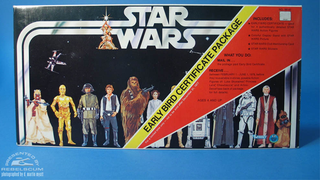 Header Image: Kenner's infamous 'Early Bird Certificate' Package for their new Star Wars toys released for Christmas 1977. Photo by D. Martin Myatt for Rebel Scum. As a precursor to this list, I'll note that I've not included Sports trading cards here, as they're a whole other ball game (ba-dum-tish) - there's some amazingly pricey cards out there envied by collectors the world over, from $100,000 Rookie Michael Jordan cards, to the famous T206 Honus Wagner card worth a whopping $2.8 million. They make a lot of the toys and cards here look like chump change, despite their plentiful worth. So that aside, let's take a look shall we? Ah, the infamous Boba Fett. This figure's taken on a huge cult status amongst Star Wars figure fans thanks to its rarity - Kenner's plan to release the figure with the advertised firing Rocket jetpack (originally part of a mail-away offer ahead of The Empire Strikes Back) were quickly scuppered as the figure went into production with a spate of incidents where children were being injured by spring-loaded projectiles in toys. Fearing a backlash, Kenner hastily recalled as many firing Fetts as they could and replaced him with an alternate where the rocket was glued into the backpack. As such, this Boba Fett figure is now extremely rare - only a few are still out in the wild (despite Kenner's attempts to deny they ever made one) amongst painted an unpainted prototypes that feature the L-Shaped firing mechanism. A rocket firing figure, depending on the condition, can fetch anywhere between $5-10,000 or even higher - a prototype sold on eBay a year ago for $22,000. In what was in hindsight an incredible devious move by Blizzard and Cryptozoic, World of Warcraft's Trading Card Game came with 'loot cards' in each set - cards that you could use as normal cards in the game, but which had a code for an in-game item, usually a vanity cosmetic pet or an effect to put on your character. Some however, came with one of the most coveted items you can get - an in-game mount. The most prized mount from the TCG was the Swift Spectral Tiger, which came in the Fires of Outland series - already incredibly rare for a Loot card, but now even rarer thanks to the fact that the TCG is out of print. Players desperate for such a unique mount whipped up a frenzy to get an unscratched card, and although the value has lowered since the height of its popularity, an unused card can still net you a whopping $700. At first you might think that it's odd for Captain America and Iron Man minifigures to be so rare since there's been dozens of them across a variety of Lego sets in recent years - but these specific figures are definitely rarer than the average Lego figure. The two figures were from Lego's New York Toy Fair preview in 2012, a teaser for the their upcoming line of Lego Marvel Superheroes sets they'd revealed at SDCC 2011. Two things make these figures stand out against the 'normal' Cap and Iron man figures: They were prototypes based on the then-current comic book designs for the characters rather than the movie incarnations, but secondly Iron Man's head. It's unique as Lego chose against printing the helmet on a normal Lego figure head for production, instead creating an openable helmet that slotted over the usual head (which reveals the smirking face of Tony Stark underneath it now). As such, combined with the popularity of Lego Marvel figures, these two command a lofty price of anywhere between $1000 to $1,500 if they come with the Toy fair pass and bag they originally came with. The first ever run of Pokémon Cards has a bunch of valuable items in it, but one of the most coveted is the first ever Shiny Charizard found in Edition 1 - and even rarer than that, a version of the card that is 'shadowless' - where the main image of the Pokémon was not accompanied by a shadowed bevel. Depending on the condition, the price can vary wildly - an ungraded, non-mint card can still fetch around $60, but Max-graded minted versions of the Shadowless Charizard can sell for up to $3,000. This prototype toy from LJN's Thundercats line never made it to market - the bubble-blowing effect they had planned was considered infeasible for mass production - but several prototyped designs have gotten their way into Collector's hands over the years as a holy grail for Thundercats fans. Prototypes themselves are extremely hard to come by - they're so popular that even custom made version of the toy from the original molds can sell for roughly $800. That's a lot even for a reproduction! The very first Garbage Pail Kids series of cards commands a pretty decent price these days, thanks to a recent resurgence in the franchise and a reprint of the originals a few years ago - sparked by an Adam Bomb Card going for almost $5000 in 2012. Although the card's value has since dropped, a full set of the original series can still go for anywhere between $200 and $800 dollars. Okay, so I said we wouldn't do sports cards, but sports figures totally count, right? The above pictured Babe Ruth from McFarlane's 'Sports Picks' series isn't a rare one - the rare is a variant version of the figure with a blue hat. Only 5 were ever produced: 2 stayed in McFarlane's archives, and 3 went into random retail packs of the figures. When one finally appeared on eBay, it sold for $13,600. The Black Lotus returns! Kinda sorta. The Lotus card appeared in two different series of Magic: The Gathering - the first limited edition Alpha, like the card that rustled everyone's jimmies last week (also seen above), but also the Beta. Although not worth as much as some highly graded Alpha Lotuses, the Beta Black Lotus can still demand a pretty good price - around $5,000 even for a middle-of-the-road PSA grading. Perfect 10-graded card can be worth a huge amount though, as Pristine Comics tried to find out last week as well, putting a BGS-10 Black Lotus up for sale at $100,000. Crazy. Okay, so this one is impossible to find as it's a one of a kind, but it earns a place on the list for still being one of the rarest and highest valued toys of all time: The first ever G.I. Joe doll. Don Levine, the man behind the legendary action figure, hand sculpted the prototype (which looks vaguely like Sean Connery, if you ask me) before the doll went into production and on sale in 1964. Since then, Joe's been updated and updated to match current Army standards over the years, but this one of a kind original still commands huge value: it sold for $200,000 at auction in 2003, making it the most expensive figure in the world at the time. From the rarest figure, to the rarest Pokémon card! The Pikachu Illustrator card made news last year when one appeared on eBay, an incredibly rare occurence. Made for a CoroCoro promotion in Japan in the very early days of the TCG, the Illustrator card was a prize given to winners in a Pokémon card art contest (alongside getting a Pokémon card with your art printed in a series), only 6 were believed to exist. The graded card on eBay went unsold for a long time, before eventually selling for under the $90,000 askin price, but even ungraded version of the card have sold for $20,000 thanks to its extreme rarity. We started this list with Star Wars, let's end it with it too - there's plenty of highly valued figures in Kenner's original wave of figures, but perhaps no so much as the very first Darth Vader figure. The earliest figures of Luke, Obi-Wan and Vader all had built in 'extending lightsabers' as a feature - kids could slide a lever in the figure's wrist to pop out the full lightsaber, like the blade was igniting as it did in the movies. The double-telescoping feature was deemed too flimsy for mass production, and was later changed to a single telescoping action (which kinda looks weird). Some double-scoped figures made it on to the market, and whilst Luke DT's were more common, it's believed less than 15 of the Darth Vaders with the double-telescope exist in the wild - there are however lots of fakes on the market. Even uncarded authentic Vaders have sold for thousands of dollars, but a carded double-telescoping Vader can sell for a huge amount: One did last year in fact, going for $30,000.